See updated plots of current and past snowfall (Snowfall Charts) in the SPECIAL FEATURES menu above. The Faculty Flat Webcam can be found here. Visit the Mineral King/Sequoia Blog at http://mineral-king.blogspot.com . Registration is free! Mineral King is an alpine glacial basin encompassing an area of more than 400 acres and is the headwaters for the East Fork of the Kaweah River. Located within Sequoia National Park, the Mineral King valley is in the Mineral King subdistrict of the park. The narrow valley is approximately two miles in length and rises from an elevation of 7,400 feet at Faculty Flat to more than 7,800 feet at the end of the road. The valley is surrounded by steep inclines rising to elevations greater than 12,000 feet. The upper image (FAREWELL GAP) is a view looking south along the axis of the Mineral King valley. The East Fork of the Kaweah River is in the foreground. Farewell Gap, at 10,586 feet, is in the center of the image with the Little Kern River valley beyond. It is framed by West Florence Peak at 11,783 feet on the left , and by Vandever Mountain, at 11,947 feet, on the right. Bearskin Patch, a nearly year-round snow field is seen on the upper western slope of Vandever. Farewell Gap was the path taken in 1862 by Harry Parole when he "discovered" the Mineral King valley . This webcam is located 3.7 miles from Farewell Gap at an elevation of 7,830 feet. The Crowley Family is greatfully acknowledged for hosting this webcam. The lower image (MINERAL KING) is a view looking in the opposite direction, north toward Timber Gap which is at an elevation of 9,511 feet. Timbers from that area were used for shoring in the famous, now abandon, Empire Mine located in the upper right of the image. The Empire Stamp Mill was located near the center of the image. The National Park Service's corral and tack building are in the foreground. Cabins of the old historic Mineral King community can be seen on the left in the distant foreground. 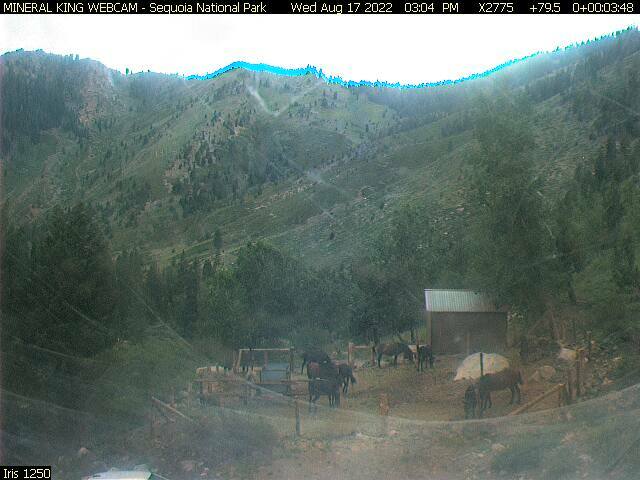 The Mineral King webcam image is taken from Potato Patch Ridge at an elevation of 7,830 feet. 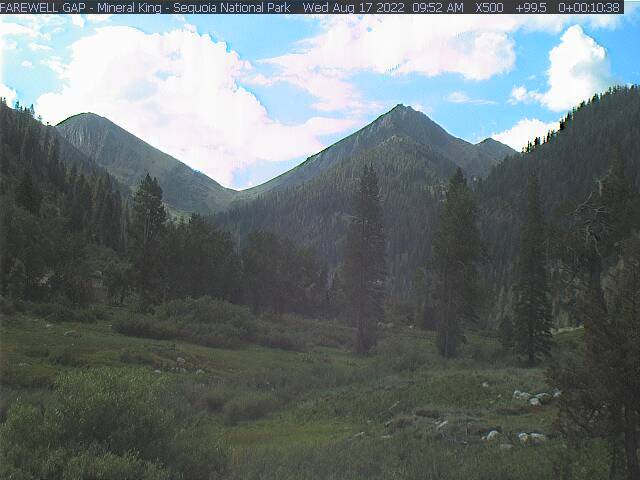 The National Park Service is greatfully acknowledged for hosting this webcam. In the winter, a 10 foot tall pole in the right foreground, with alternating one foot bands, is used to determine snow depth. Mineral King has a rich history with mining activities in the valley dating back to the 1870's when a community of several thousand people worked in the area. Because of the mining interests, the valley was excluded when Sequoia National Park was created in 1890. In the decades that followed, mining and prospecting declined and other commercial interests began to take aim at developing this pristine area of the Western Sierra. In order to preserve the valley it was annexed into Sequoia National Park in 1978. Access to the Mineral King valley is by a single, winding road that climbs more than 6,400 feet during its traverse of 25 miles starting from California Highway 198 near the town of Three Rivers. The road has no outlet, is not plowed of snow in winter, and the area is generally inaccessible from around November through April of each year. The National Park Service has road barricades preventing vehicular access from late Fall through mid-Spring although access is permitted by foot or cross-country skis. Greater detail about the road corridor and its environs can be found elsewhere on the web. Additional information about Mineral King and its history can be found at the websites of Mineral King Preservation Society and the Mineral King District Association. Visitors to the Mineral King area must bring virtually all their food and camping supplies with them since there are no commercial services available. The National Park Service operates campgrounds at Cold Springs (centrally located in the valley) and at Atwell Mill (about 6 miles down the road from the historic Mineral King community). Midway between these two campgrounds is the Silver City Resort with lodging, a restaurant and small store selling basic camping supplies and souvenier items. There is no gasoline available anywhere at Mineral King or along the access road. The nearest gas station is at Three Rivers on California Highway 198, about 25 miles down the winding MK road. These are not "live" webcams since there is no electrical power anywhere in the Mineral King valley to support such operation. All the webcams and the meteorological station obtain power from solar panels that store energy in batteries. Webcam pictures are obtained several times each day throughout the year depending on solar power availability (see "Picture Schedule" in the Special Features Menu). Estimated air temperature, wind direction, and snow depth are also provided on this page. On occasion there may be the serendipitous view of wildlife such as deer or bear that inhabit the area. The town of Three Rivers is the gateway to Sequoia and Kings Canyon National Parks. Located on California Highway 198, locally named Sierra Drive, Three Rivers offers lodging, restaurants, grocery markets, a pharmacy, internet cafe, auto repair service, and many souvenier-antique-curio shops. The road to Mineral King branches off from Highway 198 about 4 miles past Three Rivers at Hammond junction. The Kaweah Commonwealth is a weekly newpaper published in Three Rivers and provides information about local activities, current events in the national parks, road conditions and closures, and human interest articles about the history and culture of the surrounding area. Copies are available at most merchants in Three Rivers and mail subscriptions are available for out-of-town distribution. The Faculty Flat webcam has operated since 2005; the Mineral King webcam since 2006; and the Farewell Gap webcam began operation in October 2010. Special thanks go to the Sequoia National Park administration without whose support these webcams would not have been possible. If you have a technical interest in this webcam project please see the web article that provides a technical description of its design and operation. Comments and suggestions are welcome and can be directed to the webmaster. The Mineral King webcam is privately owned and operated, and costs about $75 each month to operate. If you'd like to help support the webcam donations are greatly appreciated ~ just click on the "Donate" button below. Credit cards are accepted and you don't need to be a member of PayPal.